Jeff Counts feeding chickens, age 4. Like others, I've seen the acres of empty lots in Detroit working themselves back to grasslands, and it made me remember times spent in the rural South during the 1950s, when people lived off their own chickens, pigs and produce. All at their door step. It made me wonder with all sorts of people on food stamps in the city, why don't people start raising their own chickens. Raising chickens in backyards is becoming trendy again as people get more interested in local food and where it comes from. In hip Ann Arbor a resident has been challenging city ordinances against chicken raising, and in one of my favorite TV shows, "Duck Dynasty" one of the Robertsons is in trouble with his upscale neighborhood association for having chickens running around on his place. I'm all for this new trend, and think we should go back to our country roots and produce our own food. Whole Foods has made a fortune by doing what my grandparents in Arkansas did for their entire lives. A Sunday chicken dinner simply meant a walk to the coop with an ax to to cut off the head of what country people called a "hen." I remember those days well. Pre-dawn trips to the hen house with my grandmother, her with flashlight in hand. She'd gently nudge the hen off its nest and pluck the fresh eggs out for breakfast. 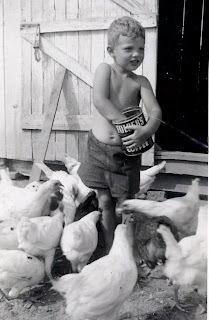 These days neighbors would object, but I loved the earthy smells of the chicken coop, and loved to feed them. I can still remember 60 years later how the chickens gathered around me. As for vegetables, it was a short walk to the garden, where there was fresh corn, tomatoes, okra, big purple onions, and green peppers. The produce had only the chemicals you put on them, and you weren't left to guess. And you didn't have to start up the car for a trip to the store.